We are very pleased with the great success our KS2 pupils have had by practicing English and Welsh spelling words at home during the week. Spelling words for the week are provided to pupils on a Tuesday afternoon. We suggest they spend about 15 minutes each evening practicing these words in preparation for a test given on Friday morning. Pupils will also be bringing a reading book home with them each Tuesday. In an attempt to raise standards of reading and reading comprehension we hope pupils will also spend 10 minutes (or more if you wish) each evening reading their book with an adult. Reading records will be provided (link below) for parents and carers to provide a comment on the progress of reading during the week if possible. We also have added a list of discussion points you can raise with your child as they are reading their book with you. If you have any questions please see your class teacher who will be happy to help. 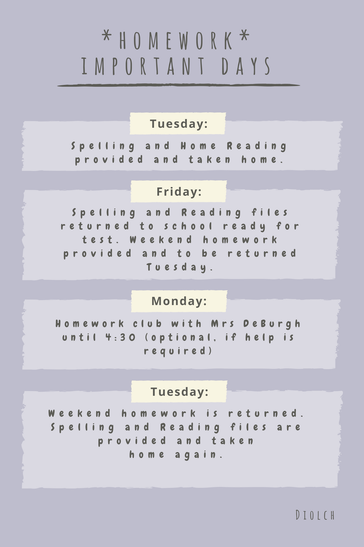 TEACHERS WOULD APPRECIATE IF YOU COULD SUPPORT YOU CHILD IN THIS WEEKLY HOMEWORK AS WELL AS HELPING THEM TO REMEMBER TO RETURN THEIR FILES TO SCHOOL ON THE APPROPRIATE DAYS. LOST OR DAMAGED READING BOOKS WILL INCUR A CHARGE – PLEASE LOOK AFTER OUR BOOKS.